Arfe Terrace is a beautiful place with private terrace. It is located in the very center of Seville, at Arfe street, a few meters from the Cathedral and the historical building Archivo de Indias. 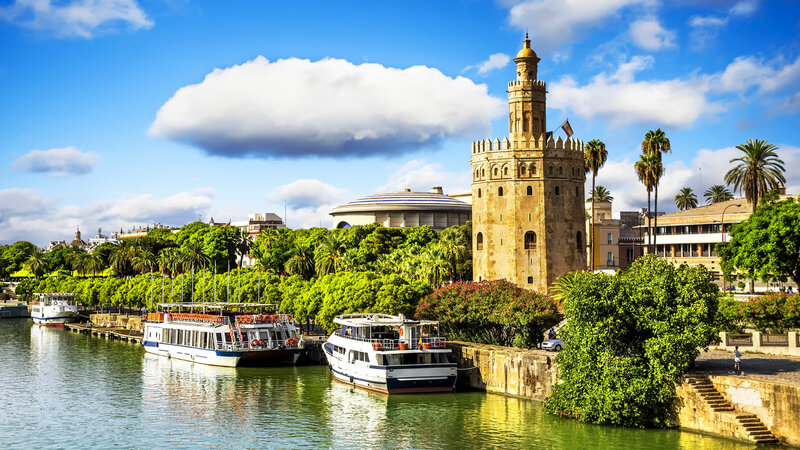 El Arenal is one of the most selected and expensive areas of Seville; it is a completely safe district and a cheering, funny area with plenty of bars, terraces, restaurants and many little shops for food. The appartment is designed with neutral, elegant colors, and it consists of two bedrooms. In the first one there is a double bed which is 1,50 meters large x 2 meters long, it is facing out to a little and beautiful courtyard furnished with some big wardrobes. In the second bedroom there are two single beds folded in a modern and twin structure easily convertible. There is also a big window and a balcony facing outside. The living room is roomy and comfortable, there are other two balconies facing outside and much natural light coming into the whole room. There is a convertible sofa which provides the appartment with capacity for 6 people(120cm). There is a spacious kitchen connected to the living room and it is well equiped with many appliances and utensils. Finally there is a big, independent bathroom provided with both a bath and a shower. The terrace is about 20 sqm and there are a garden table, many plants and all the rest of facilities. This terrace, whose access is outside the apartment ( 2 floor above), offers a perfect view of the Cathedral and the Giralda tower.